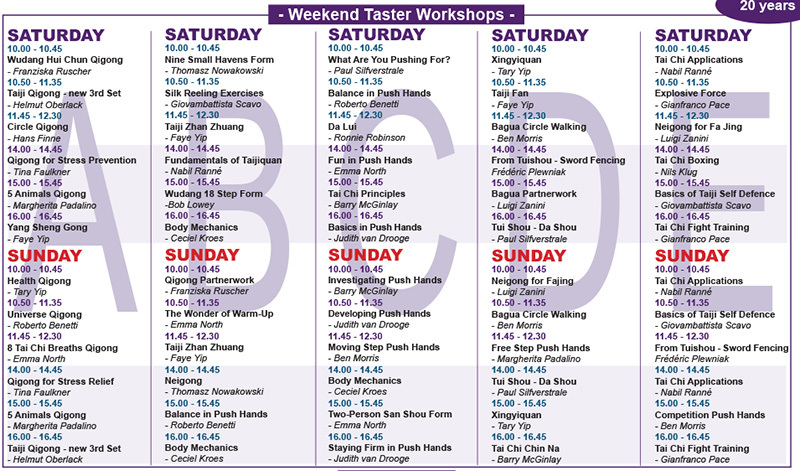 Over the course of the weekend, Saturday and Sunday, we offer a choice of 60 x 45 minute taster workshops. To allow you to make easy choices from the topics we offer they are divided into five distinct sections. The middle section (C) offers an introduction to safely-structured partner exercises and a continuation of tai chi principles. These seminars will enable you to gain a deeper insight to both the meaning and purpose of these arts. The fourth column (D) provides an opportunity to experiment with other aspects and disciplines of Chinese Internal Arts including Bagua and Xingyi, weapons, as well as more advanced partner work. Finally, column (E) allows you to work with martial applications. We suggest you work in areas from A-E according to your level of experience. All the instructors have many years experience and will help you to gain more from your learning and practice. Please feel free to ask any questions before participating in these workshops. We respectfully suggest you take responsibility for your own well-being.